Sarah Robinson, a partner at Teal, Becker & Chiaramonte, CPAs, P.C. (TBC) has recently been named to the Albany Business Review’s list of Forty Under 40. The award honors 40 professionals in the Capital Region who are under 40 years of age for their outstanding business achievements and community influences. To be eligible, candidates must live and do business in the Capital Region counties that the Business Review covers for business news. Robinson, 38 years old, is the third TBC employee to receive this accolade since the program’s inception in 2000. As one of the 40 honorees selected by an advisory committee of business leaders, she will be honored on May 12th at the Albany Capital Center, Albany’s newest convention center. 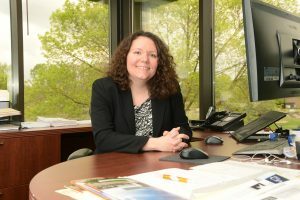 Robinson joined the Firm in 1999, after receiving her Bachelor of Science in Accounting degree from the College of Saint Rose. She passed the CPA exam two years later. “I have been incredibly lucky to work with people who allowed me to take on leadership roles on client engagements early on,” Robinson said in regards to her advancement to partner at TBC. By 2014, she was named a partner at the Firm and found herself in charge of many of TBC’s client engagements in the various areas of the business including employee benefit plan audits, automobile dealerships and not-for-profit audits. Outside of the office, she gives back to the community in a significant way by participating as a Board of Director, specifically serving as the Treasurer, for the Regional Food Bank of Northeastern New York. In addition to Robinson’s client work, she plays an important role in leading the Firm’s internal senior accountant roundtable to encourage younger staff’s growth through sharing of experiences and knowledge. She is a member of the American Institute of Certified Public Accountants and is involved specifically with the AICPA’s employee benefit plan quality control center and internally, she sits on the firm’s employee benefit plan audit niche committee.